— and now I have my DVD set from Amazon on the way. Pretty much every day I get into a conversation with someone about whether “times are worse today than they were for our parents and/or [fill in the blank to any decade past]”. I have my *opinions*, but I have not dug up actual facts to support my own personal hypothesis. Even before I would, though, I’d want to discuss: What specific aspects of life are we going to measure to determine what may be *better*, exactly, or what may be *worse*? We need to have a discussion around these assumptions and parameters first, I think, to then be able to measure and compare now vs. then. Anyway: In that vein, I love the concept of this TV series. 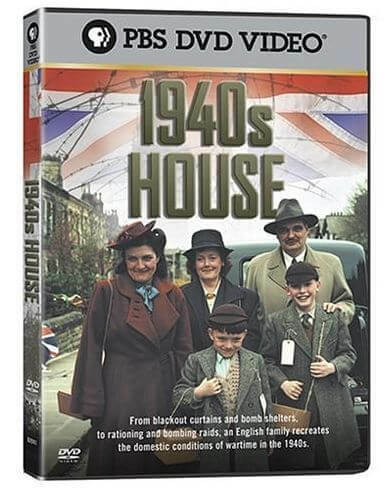 I guess you’d call it a retro-reality show: A family is put into a constructed environment recreating what it was like to live in the midst of WWII England — housing, food, amenities, technology … or lack thereof. They must deal. I can’t wait to watch. Regency House Party was another fun show. Sort of Jane Austen meets the Bachelor. Have you all heard about this gal, Carolyn Ekins? She’s using a wartime ration plan to lose weight and live more simply in the process. I’ve just started reading her blog but it sounds like she’s staying right with the strict rations and using recipes from that time. It’s pretty interesting to read about her progress. looks very cool — i will check it out! thanks! I think I offer a slightly different perspective than many…I grew up in central appalachia…south eastern ky, in a coal mining community. My mothers home was constructed from two old camp houses that were moved to the present locaton…check out my blog..my old ky home..and although I was born in the 60’s we didnt have plumbing, or central heat…we used pot bellied heating stoves and our fuel souce was “house coal.”. I think how very fortunate I am today, but also, how spoiled our society has become. What is now a “necessity” is quite different than what used to be. Entertainiment used to be “talking and story telling”…..our front porches were our “living rooms”..I think we have it made today…but we need to realize out very lucky we are …and learn to enjoy the simple things…just because they are wonderful!